In the spirit of full disclosure I must confess that the timeline in this retelling is askew. I decided it would be easier to follow if the retelling progressed in a chronological order. Truthfully, the order was more chaotic, something like: sideways, back-the-way-you-came, chase a rolling ball (in the wrong direction), screech to a halt, push a boulder up a hill, and leap over a canyon. My Orange County feelers had been out since 2008, but the information I was getting led me on goose chase after wild goose chase. Add my myopic searching technique and the fact that I was missing a big piece of the puzzle (the whole Michigan interlude), most of what I learned early on did me no good. I attempted to go from point B to point E directly. New York bound, I started to really dig into anything I could land my hands on. Full immersion seemed to be the order of the day. My first query was to the OCGSNY Yahoo group. That lead to a big discussion on the Sarah Wells/William Bull family and one of their famous "sons", James Faulkner, who married Catherine Bull. Not much else was know of him, but I did learn of the "Bull Family Genealogy" book, or the "Blue Book" as it is sometimes referred to. And a section on Faulkner genealogy. What?!? A Faulkner genealogy??? This seemed too good to be true. And, it was. Sort of. But before I learned that I, without hesitation, placed my request for the book through the interlibrary loan program. The day it arrived was better than Christmas! The book was a good 5 inches thick and read like stale toast. 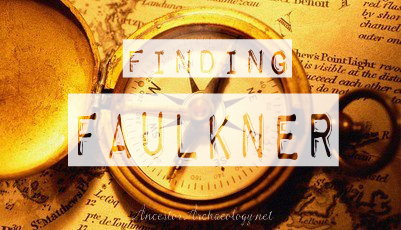 But there were Faulkners in it!! Lots of them! And McBrides too! Surely I was going to find my answers here. I toted that book to work for well over three weeks, sneaking copies of the relevant pages. Then I started to recreate the family as laid out in the Blue Book. Only I was focused on the Faulkners and not the Bulls. A story for another time, let me just say it was very interesting to see an entirely new book emerge from the information contained within the Blue Book's pages. Now that I had enough information to progress, I pulled out all the bits I had been compiling. I worked that big tree, I had email conversations with other researchers, including the Bull Family genealogist. (Surely SHE would have the answers!) Seems no one could identify James, my James. As it turned out, I was the one to introduce James to the genealogy world. Until I brought his existence to light he was on no one's radar. Least-wise not that I have been able to find, even to this day. Poor James. My introduction of this new James Faulkner, married to Martha McBride, started a maelstrom of speculation on his parentage. The known Faulkner's of Wallkill were all Presbyterian (promising!) most were members of the Goodwill Presbyterian Church. I borrowed all the books I could find pertaining to these church records. There were a number of them, it turned out. Surely there would be a mention of a marriage or baptism. I soon began to see James turn up on Ancestry as a son of either James (who married Catherine Bull) or His brother Colonel William Faulkner. These were my top choices too, but the documentation was just not there. Why were other researchers including him in their families? I needed to dig deeper. In one of the many Orange County history books I borrowed (before they were digitized! ), the History of Orange Co , page 431 had this sentence: "Still further east the Faulkner family made an early settlement." I found several other references to the family, all rather elusive, they were clearly not as prominent as some of the other early players in Wallkill. Seems their roll was more supporting than starring. Frustrated. A bit dismayed, I soldiered on. My best source was the now defunct Scotchtown Highlander. Sal, the site's curator sent me lots and lots of information. (I recently found an archived version of the site at the Middletown Thrall Library.) It contained nothing more on James, however. And absolutely no hint as to his actual parentage. How could a man who was seemingly as involved, militarily and politically, as James not make the history books? I was spinning in circles and getting nowhere. The bits and pieces of Faulkner information I was able to acquire were not adding up. This was one tough nut! I turned once again to Ancestry, and the trees to which James had been added. Contacting the tree owners, posting to message boards. The return? Zero. Zip. Nada. The tree owners had merely copied James from other trees (my tree unfortunately, before I took it private), no one had a source, a fact, that I did not have. It all pointed back to me. Confusing the issue (because, why not!) Sal from Scotchtown Highlander sent me an abstract of a will of one William Faulkender of Wallkill, who died in 1784. He believed this was the original Faulkner, but could find no proof, other than this typed abstract. The name was not quite right. I had seen this floating around Ancestry, mostly tied to a Faulkender family in Pennsylvania. (There was no end to the confusion that was occurring at this time!) The will listed a wife named Mary (no last name), and four sons, Joseph (deceased), James, Samuel and William. This will did line up with what the author of the Blue Book had concluded; That a William Faulkner was the father of four sons with the same names as these Faulkender boys. But little more was written, as the subject was about the Bull family, not the Faulkner family. This gave me four possibilities for James' father. There was nothing more written of Joseph, and all that was said about Samuel was that he had married Elizabeth Wilkin. I already had explored James and William, and although both were good candidates, the research had been done rather well for the Blue Book, there was not a James listed as a son of either of them. Increasingly frustrated, and now confused I set out to begin research on Joseph and Samuel. "The quiet boys". The two who did not leave any noticeable mark on the record of time. Not an easy feat, it turned out. Hitting dead end after dead end, these men really did not leave any breadcrumbs! I found a mention, once, of a Samuel, nothing that would illuminate the search of course, and nothing on Joseph. Nothing. Posting to message boards proved fruitless. Even OCGSNY had no suggestions. Joseph and Samuel lived so quietly they became invisible. Bear in mind I was searching for pre-1780 documents. And at a time when less was digitized. I had been digging in New York for well over a year with not much to show for it. Short of a trip to the Hudson Valley, which was not an option, I resigned to put the quest to find Faulkner on the back burner for a while.